OMG, its June already. Time does fly when you are busy and we’ve been super busy this May. On top of getting the spring yard work and gardening done, we did a two week European vacation. 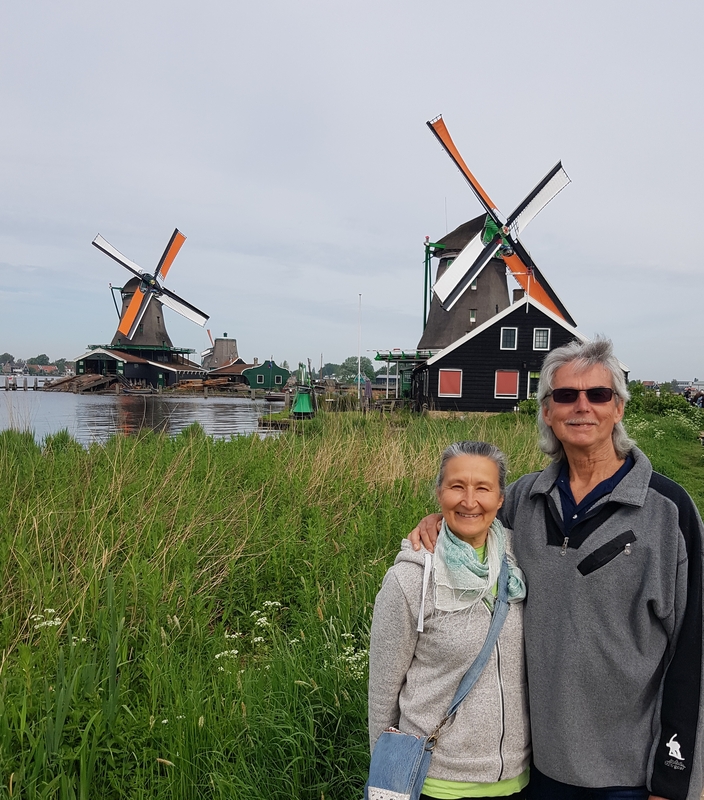 We are back from another of Ken’s group vacations, – this time, to the Netherlands and England. The trip was arranged through Air Transat and Jumbo Tours. There were 27 of us and what a great bunch of travelers. Many have traveled with us before but we had quite a few new friends as well. Our tour guide for the trip was Bruno, an enthusiastic Frenchman who kept us all walking and on schedule. By the end of the trip Bruno’s “short walks” became the group joke. The first half of the trip was centered in Amsterdam. Our location could not have been more perfect. We stayed at the IBIS Hotel right beside Central Station in the heart of Amsterdam. It was a “short Bruno walk” to almost everything. The bike traffic in Amsterdam was awe inspiring. 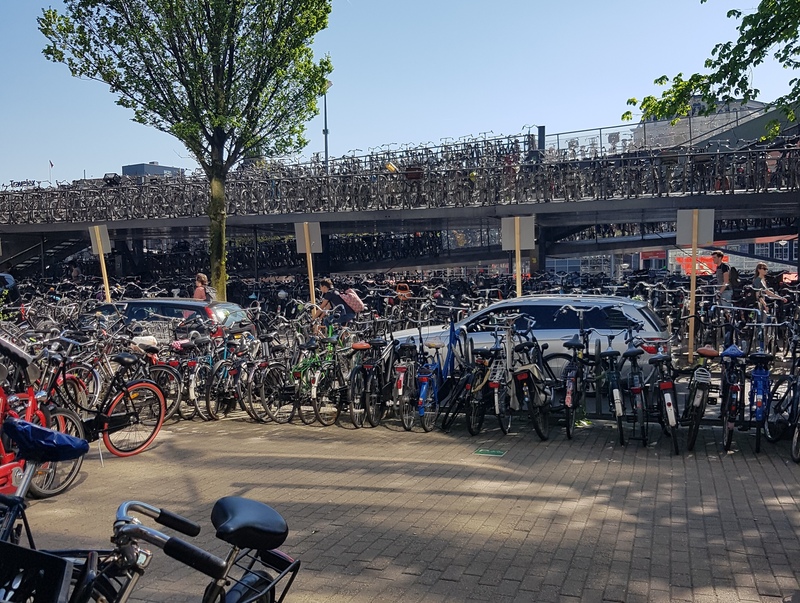 Central Station had a three story bike parking area and it was always packed with bikes. A steady stream of bikes came and went from Central Station all day, but it was particularly intense during morning and evening rush hour. The dedicated bike lanes are used by bikes, motor scooters, and tiny tiny cars. You needed to be very vigilant as a pedestrian crossing the bike lanes as they do not stop for anyone. 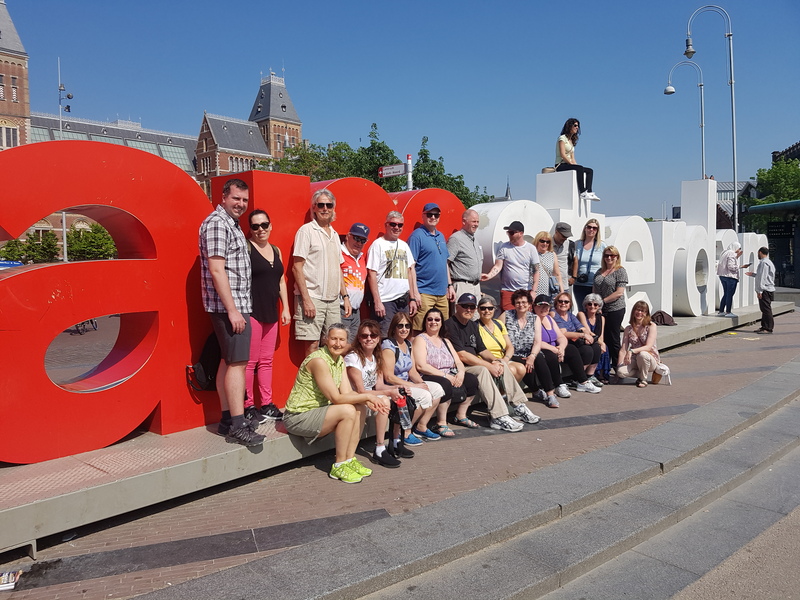 Our second day included city tour of Amsterdam by bus and boat, and a trip to Keukenhof Gardens. The city is amazing, as is the history of how it was it was created. A series of dikes and canals were built and the water pumped out to sea, turning former lakes into land. Everywhere you turn there is another canal, another unique bridge, and row on row of tall skinny houses. The houses are so skinny that they could not get furniture up the skinny staircases to the upper levels, so the houses have hooks above the upper windows so furniture could be hoisted up through the windows. In fact, many of the houses slope towards the street so that the outside walls don’t get damaged by loads being hauled up. 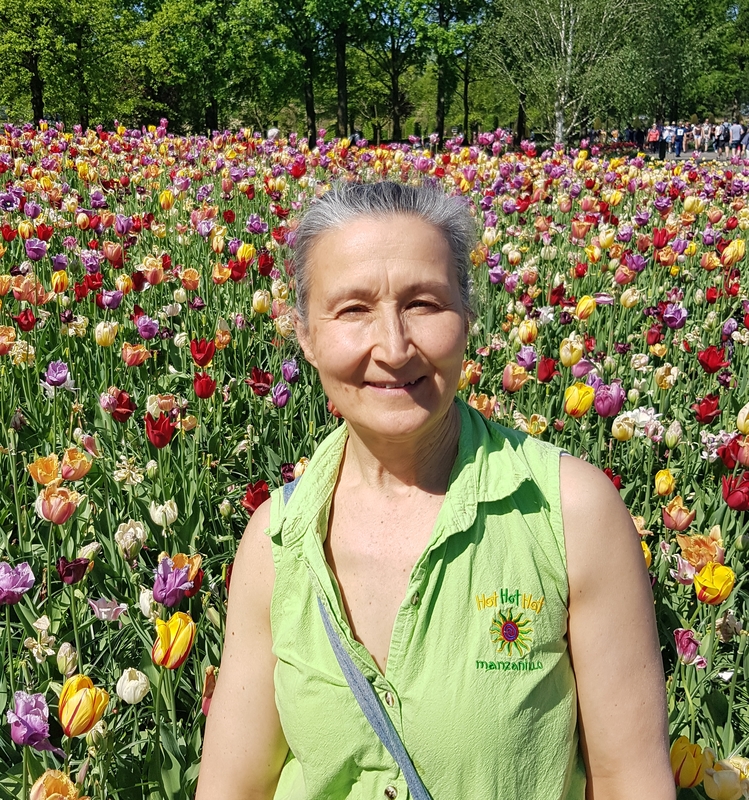 Keukenhof Gardens was a flower lover’s dream come true. Acres and acres of tulips. So many different colors and petal arrangement. 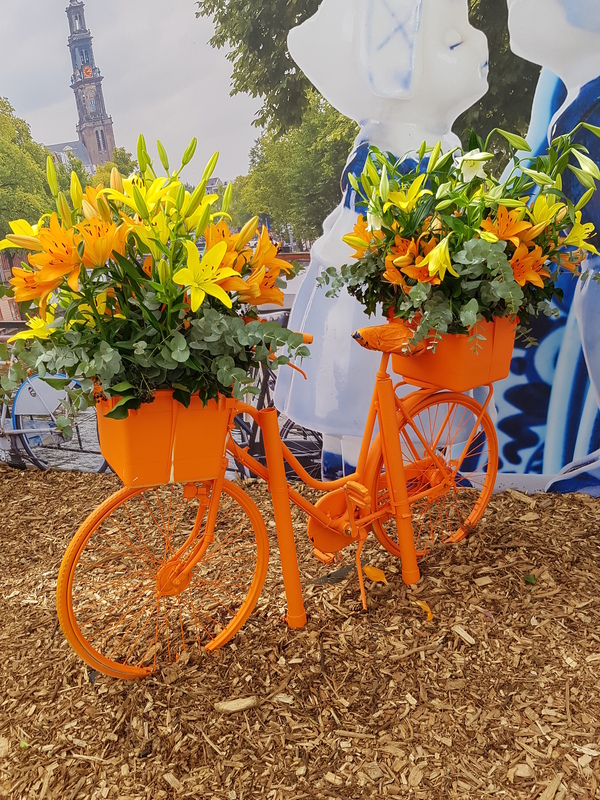 I had never seen double pedalled tulips or fringed tulips before. Lucky for us, we caught the last week of tulip season. Most of the commercial tulip bulb fields surrounding Keukenhof were already out of bloom, but there was one large field of brilliant red tulips. (Once the tulips bloom, the blooms are cut off so the plant has more energy to put into the bulb.) 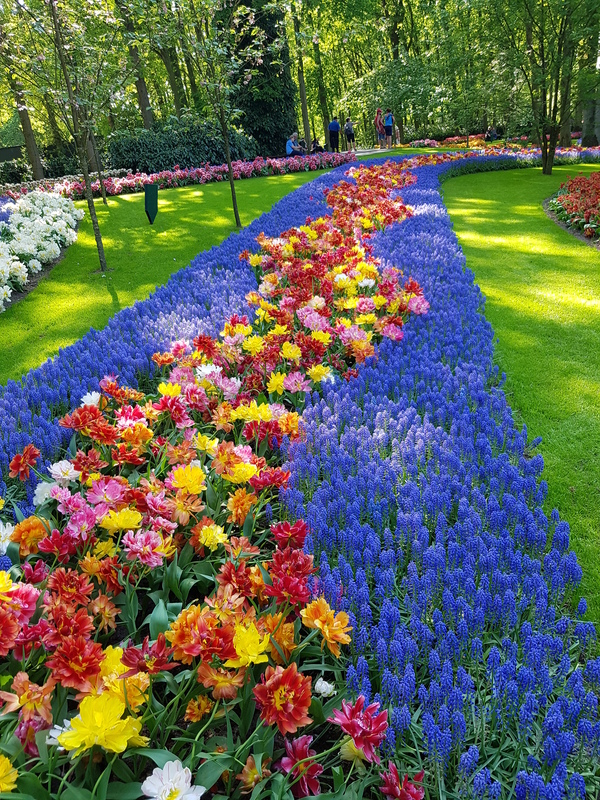 The flower beds in Keukenhof, however, were still in brilliant bloom. It was amazing to wonder around the large grounds finding so many gorgeous flower beds. Due to the time of year, you could not buy tulip bulbs to take home, but I did order a few to be shipped to me this fall. Our third day was a museum marathon day. We started with the Anne Frank House. A “short” 30 minute walk from our hotel. I have never read the Anne Frank Diary but will make of point of it now. Quite an amazing and touching story. After lunch we explored the Rijks Museum. We really enjoyed the Portrait Gallery as well as the High Society Exhibit. 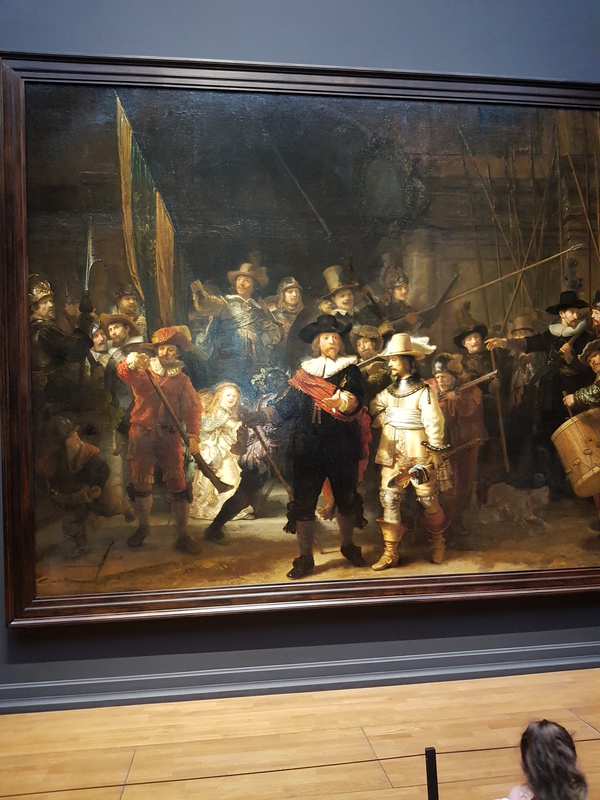 The most famous painting in the museum is Rembrandt’s Night Watch. 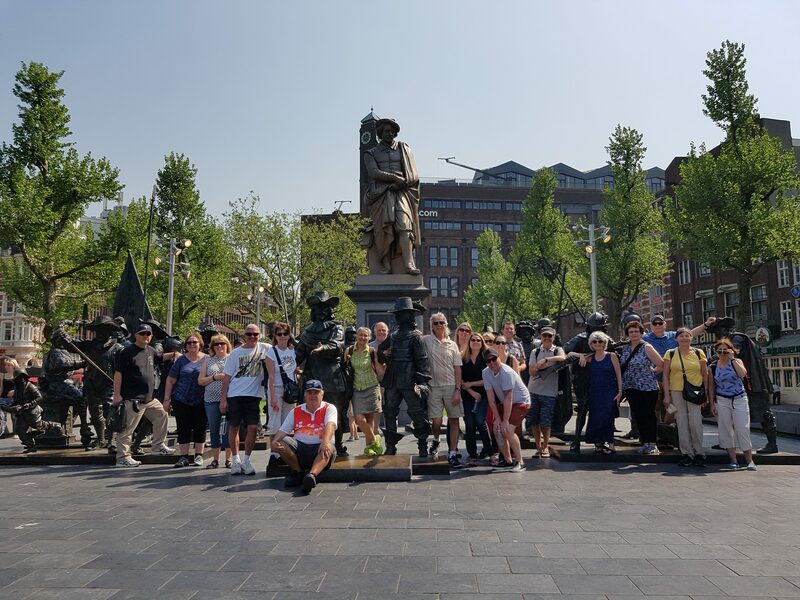 On our walk to the Rijks Museum we passed through Rembrandt Square and were able to get a group photo amongst the statues of the figures represented in the Night Watch painting. We ended the day at the Van Gogh Museum. Van Gogh is probably my favourite artist and I enjoyed learning a bit more about him. I have a copy of one of his Sunflowers paintings hanging in my kitchen and a copy of The Gleaners hanging upstairs. The Starry Night followed me home. I will have to find a place to hang it. After a day of walking from museum to museum and then walking miles and miles inside each of them, we were spent. Instead of walking back to the hotel, the group opted to try out the local tram. It was quite an adventure as the tram was packed solid. We laughed ourselves silly as we were practically pushed onto unsuspecting travelers laps. 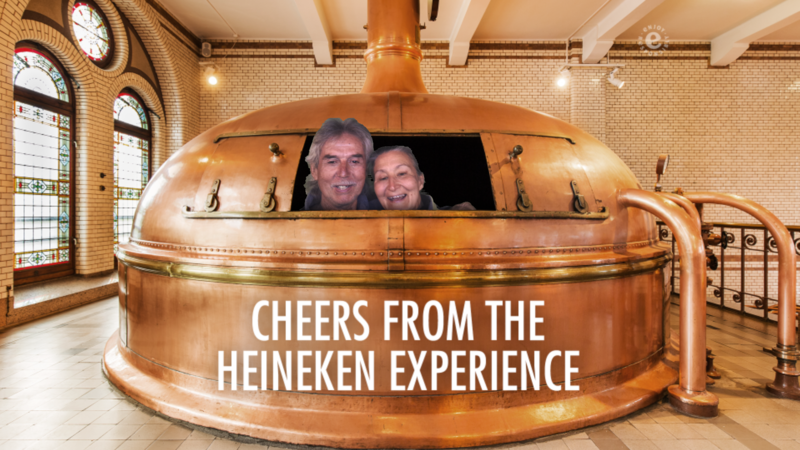 Day 4 was a tour of a different nature – the Heineken Experience. I enjoyed the first part of the tour – which explained the history of Heineken as well as an explanation of how it is brewed. Ken loved the second half which was pure fun – karaoke singing on a virtual bike ride through Amsterdam, beer pouring contests and of course the beer tasting. Something for everyone. 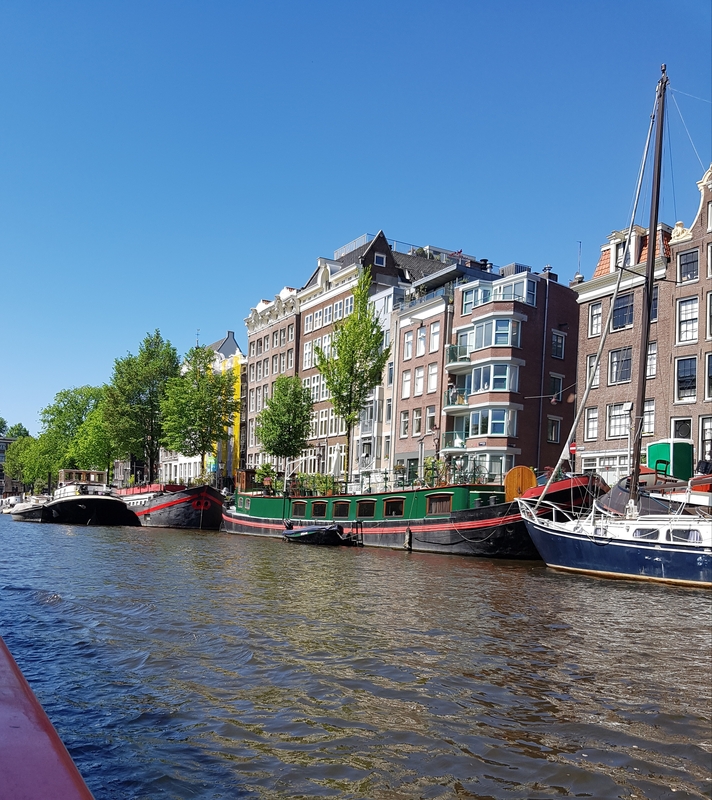 The rest of the day was free time and some of us took in the Amsterdam Dungeons – a humorous re-enactment of a rather dark side to Amsterdam’s history. I thought it was rather cheesy but Ken apparently loves cheesy, and thoroughly enjoyed it. Day 5 was a free day. Ken and I had planned to spend the day biking around Amsterdam and enjoying the myriad of bike paths. However, one of the hotel staff persuaded us to reconsider. She saw too many visitors with broken bones from bike accidents. 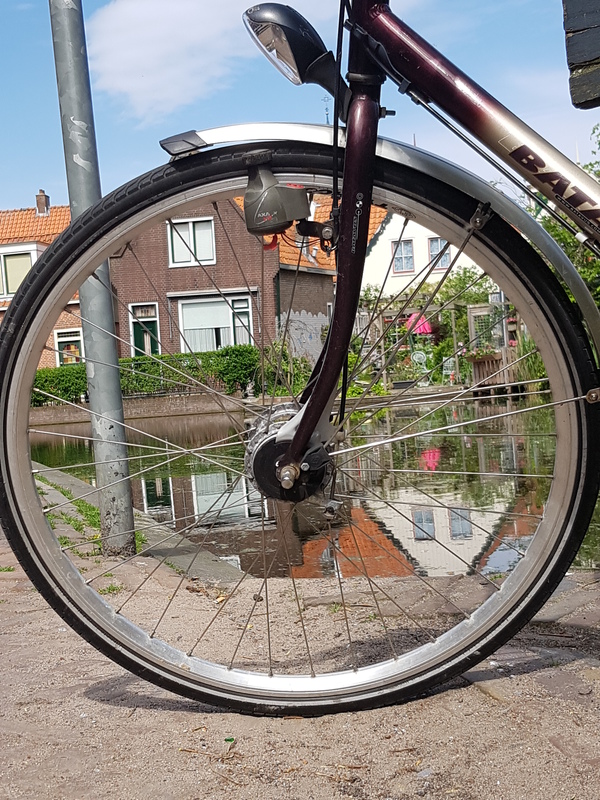 Biking is serious business in Amsterdam and not for those who don’t know where they are going, lollygagling and looking at the sights. After witnessing the frenzy of bikers, I reluctantly had to agree. 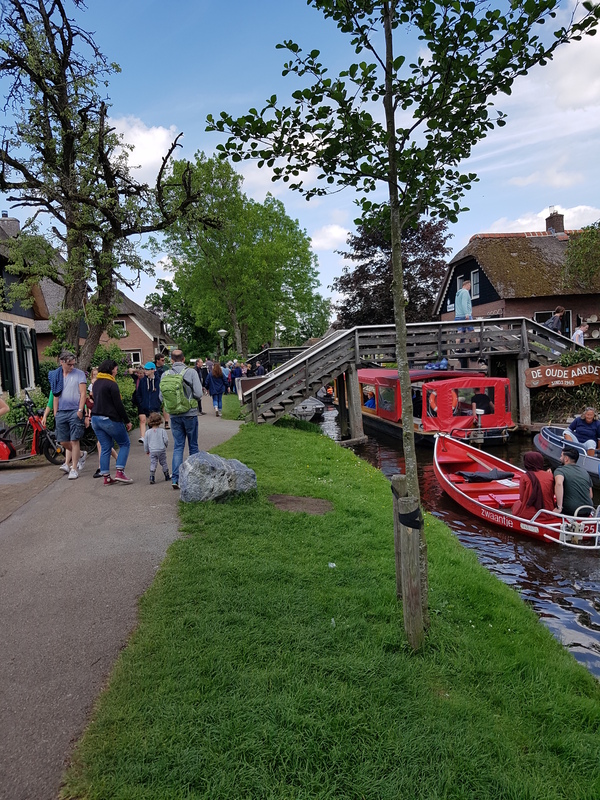 So instead we opted to get out of the city for the day and visit Giethoorn. Giethoorn is a small town with few roads, but canals instead. Most of the town only accessible by boat, foot or bike. I was really looking forward to visiting this village but was sad to find that this beautiful quaint town of 270 inhabitants was totally spoiled by presence of 5,000 tourists, which we of course were contributing to. Most of the homes have been converted into bed and breakfasts, restaurants, shops or camp grounds. Anyone who does live there has to put up with thousands of people passing by their front doors all day long. By the afternoon, the canals were bumper to bumper traffic and the paths clogged with pedestrians and bikers. It kind of reminded me of Niagara Falls – nature in all its raw beauty, alongside masses of tourists. It gave me something to ponder – how our incessant desire to see and experience new places can totally change their natural charm. 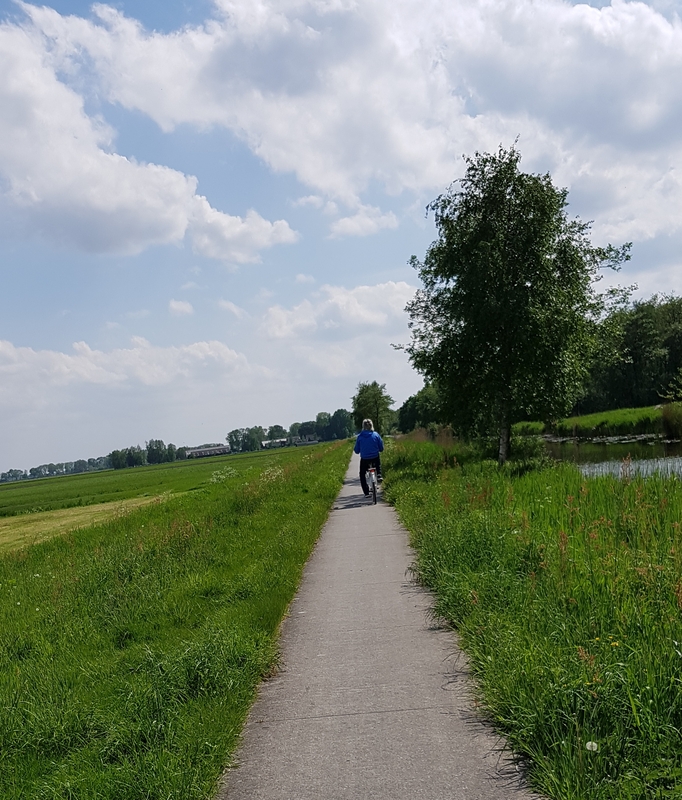 However, being in the country did give us the chance to do some biking. The bike paths inside the town were nuts, and I opted to walk my bike instead of ride. But once you left the town it was a pleasant ride in the countryside along farm yards and fields. We had a picnic lunch along a small canal. We even witnessed a typical spring event – the spreading of cow manure on the fields – very aromatic. 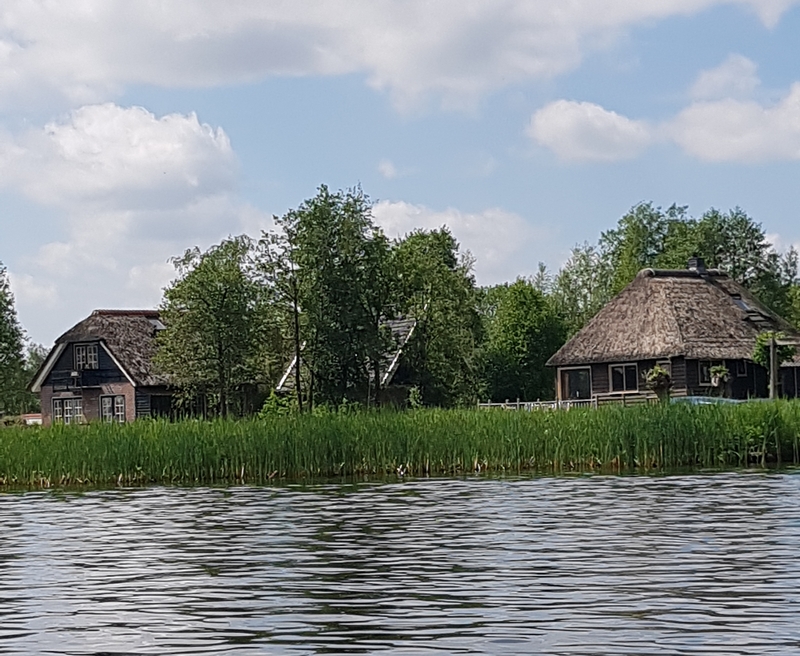 And we did enjoy the train ride out to Giethoorn, seeing the countryside. The country is trying to reduce its dependency on natural gas and oil, and has many large wind farms. Most of the land is devoted to grazing land or fodder for animals. Most of their vegetable crops are grown in large greenhouses. 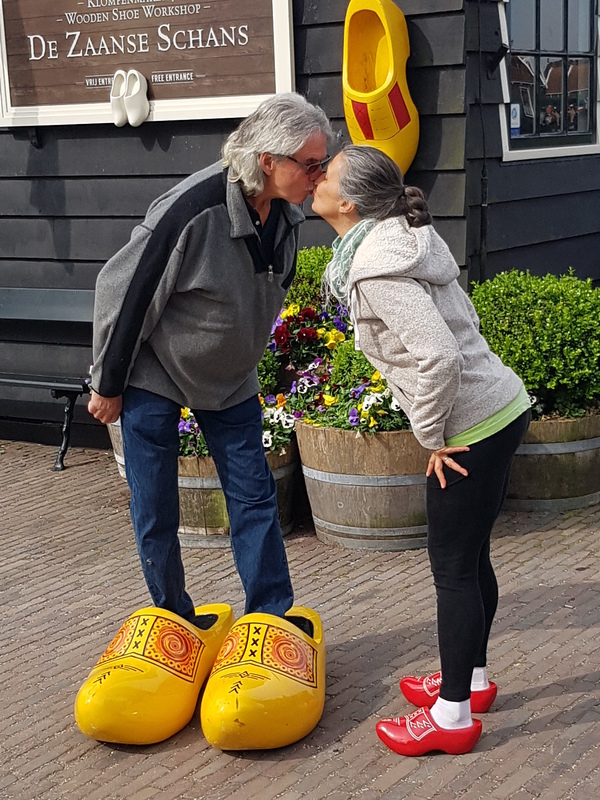 On our last day in Amsterdam we visited Zaanse Schans which has a large collection of windmills. 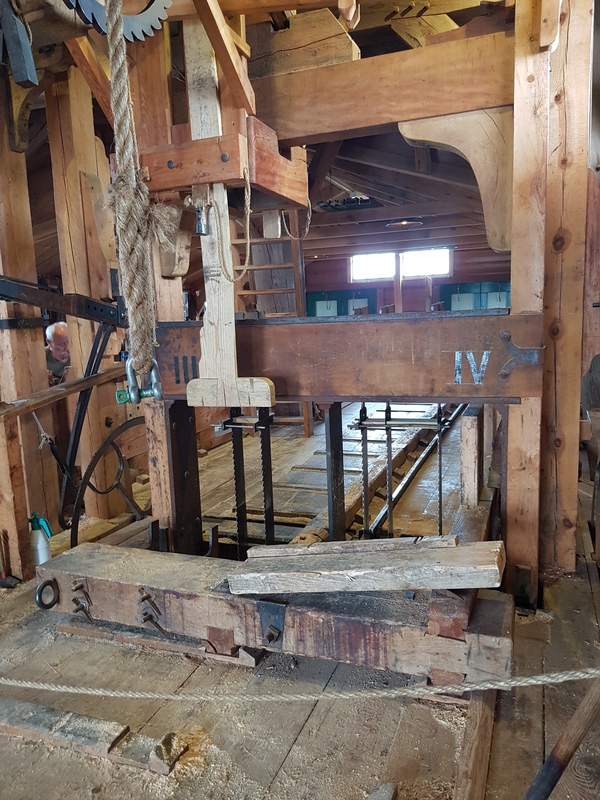 The day was calm and the windmills not turning but we got a great tour of a windmill used for milling lumber. We were the only ones there so enjoyed an extensive private tour. 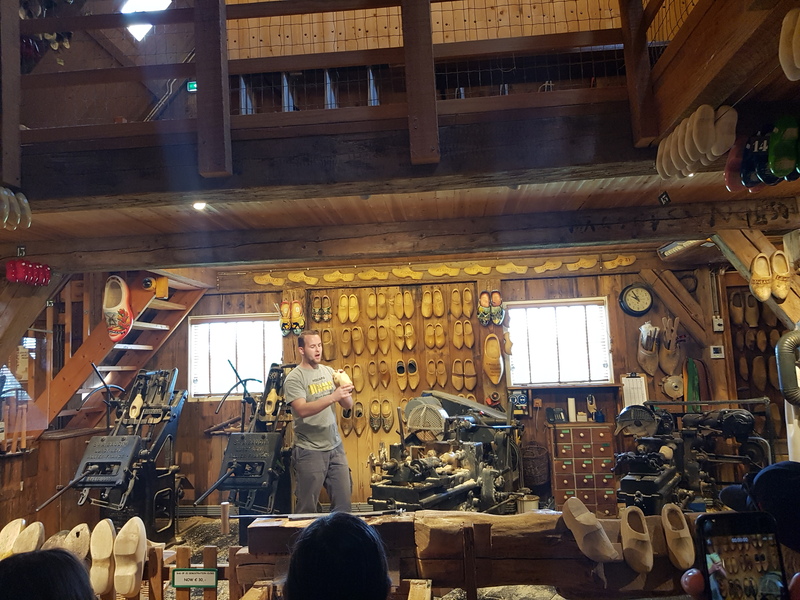 We visited the Klompenmakerij for a demo on how to make wooden shoes and some shoe shopping for a pair of bright red klompen for me. Now these are the original vegan shoe! I had hoped to wear my shoes for gardening, but so far have not been able to adjust to wearing them. Although they seem comfortable enough, they press on the top of your foot when you walk. Never-the-less, they are beautiful to look at. We also visited a cheese maker. The Dutch sure love their cheese. 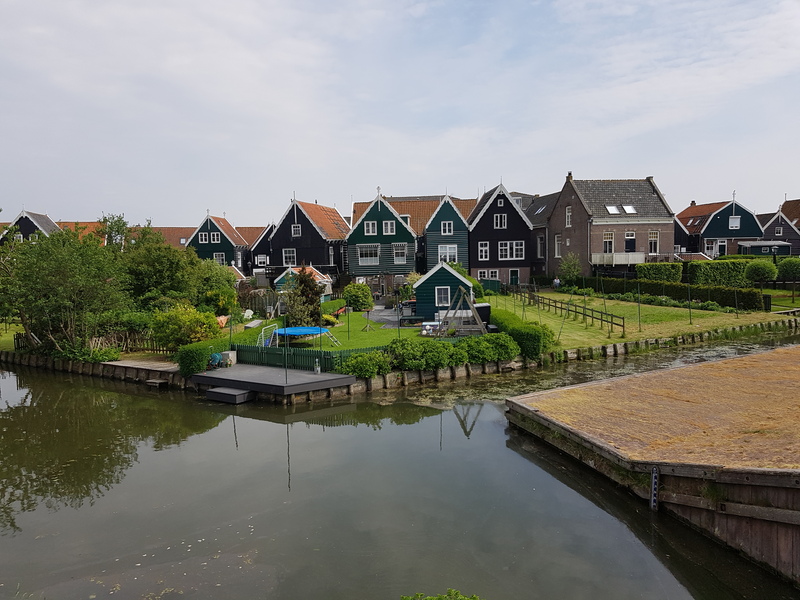 And we visited two small former fishing villages – now resort towns – Volendam and Marken. Both towns were on what was formerly the Zanderzea. After suffering a massive flood, they decided to build a dike to separate the Zandersea from the North Sea, changing the sea into a lake. 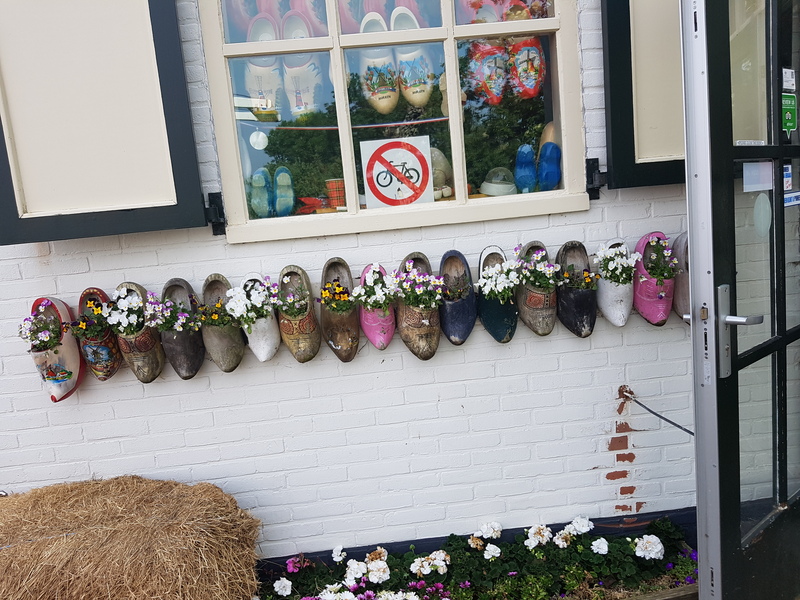 Volendam is busier and more commercial than Marken, which has more local charm. 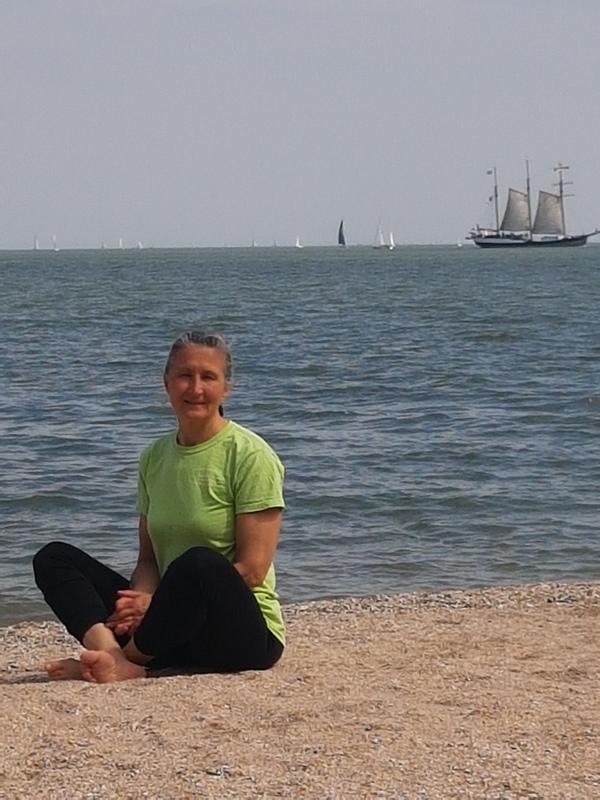 We were lucky to have a warm sunny day and enjoyed a rest on the beach. Day 7 was a traveling day, off to London to visit the Queen. 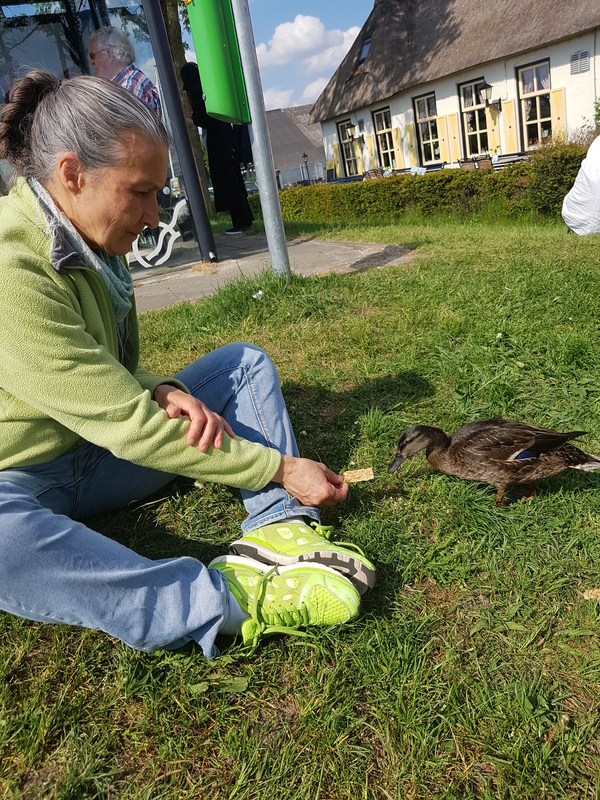 We travelled by bus and had a three hour lunch break in Ghente, Belgium. 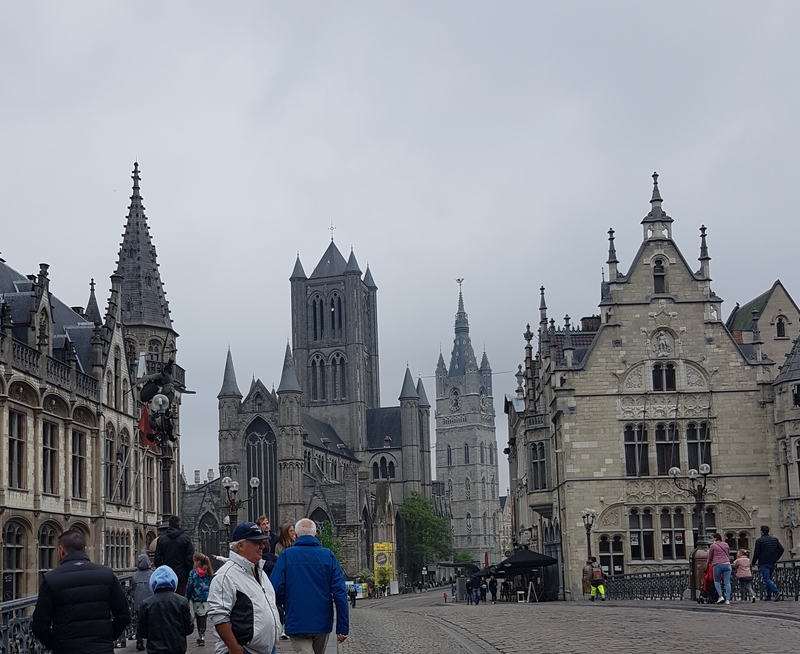 The downtown area has spectacular cathedrals, belfries and a castle. An unexpected surprise was a Food Truck Festival, where we found a Dutch Weed Burger. 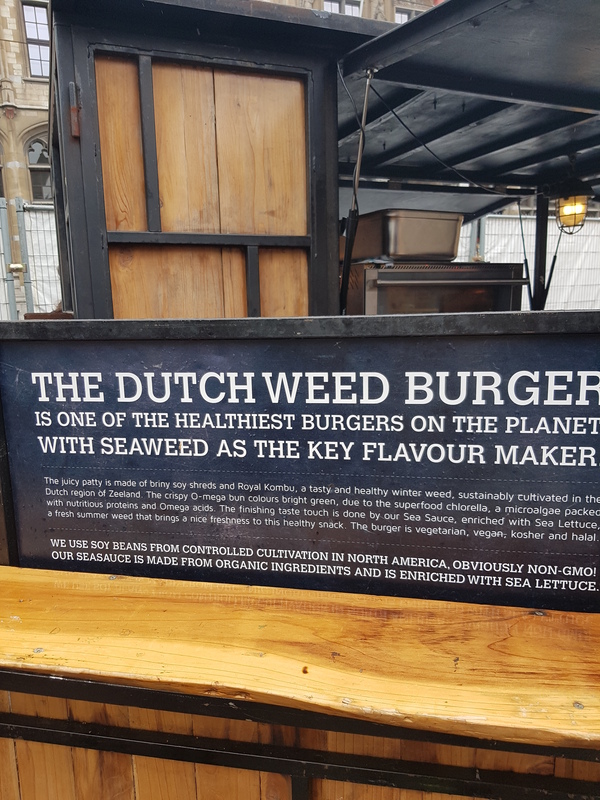 We had searched Amsterdam for this vegan specialty but could not find the restaurant. We were pretty excited to find the food truck in Ghente and took 2 weed burgers to go. And no, they are not that type of weed. These are made with seaweed. They say that Holland gets only six weeks of sunshine a year. The Dutch were very generous with us, we had sunshine and warm temperatures for the entire week. We got a few sprinkles of rain as we left the country, on our way to England. We took the ferry from Calais, France to Dover in England. The border crossing was very interesting. Not sure if security was tighter due to the upcoming wedding of Prince Harry and Meghan Markle, but we did get grilled. 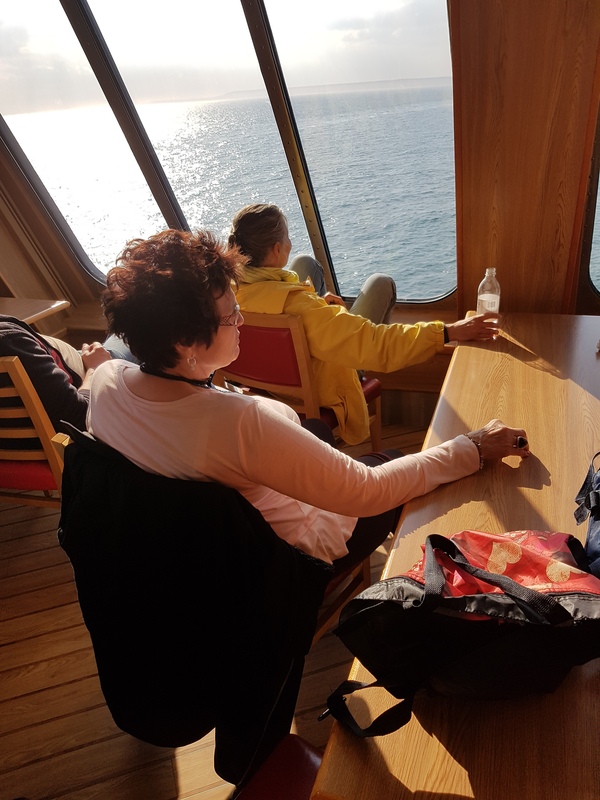 The ferry crossing was quite enjoyable and very relaxing. Stay tuned for Part 2 of our European adventure – England. More pictures from the Netherlands. 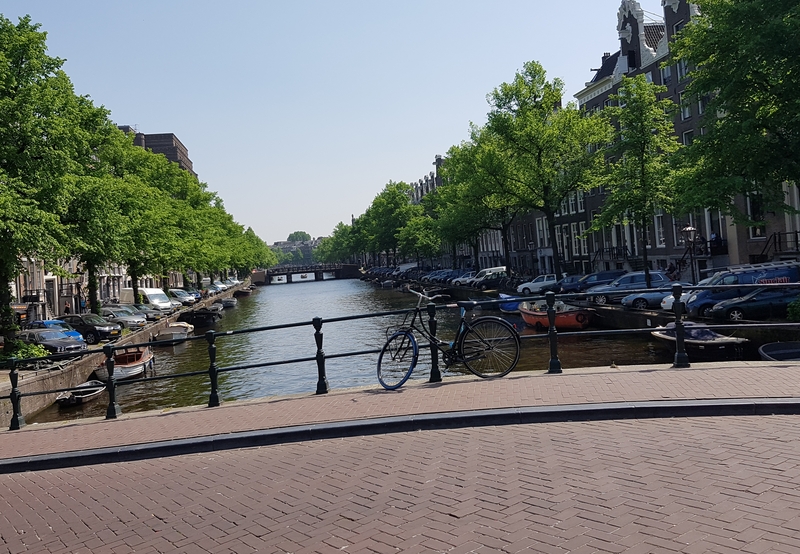 This entry was posted in Fun and tagged Amsterdam, Anne Frank House, Dutch Weed Burger, England, Ghente, Heineken Experience, Holland, Keukenhof, Klompen, London, Marken, Rikjs Museum, tulips, Van Gogh Museum, Volendam, Windmills, Wooden Shoes, Zaanse Schans. Bookmark the permalink. If you want to ride a bike in calmer urban streets just come to Vancouver. I do like biking in Vancouver.